One term that new pond owners will hear about frequently is beneficial bacteria. When most people think of bacteria, they think of the harmful variety, but some are positive and a necessity for the environment. They can be found in natural ponds and lakes, and have a number of important benefits for fish and plants. What Is Beneficial Bacteria Good For? Beneficial bacteria bring balance to ponds and will dissolve organic compounds. Some, such as aerobic bacteria, make use of oxygen to accomplish this, while anaerobic bacteria function without oxygen, but dissolve the compounds at a much slower rate. 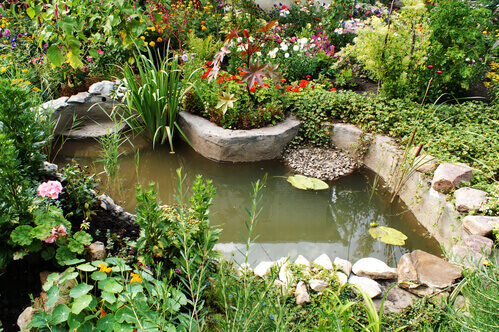 The reason you want lots of beneficial bacteria in your pond is because they will process decaying material. This ensures that the pond water remains cleaner and that the plants and animals within are healthy. Beneficial bacteria will create enzymes that give them the ability to dissolve compounds in a way that allows them to be taken in the form of nutrients. Another process that beneficial bacteria will perform is called denitrification, where nitrates will be turned into gas (nitrogen) and eliminated from the ecosystem of your pond. They can take soluble phosphorous and transform it so it becomes calcium phosphate. When these nutrients are transformed into things that cannot be consumed by algae, this prevents the occurrence of algae blooms, which are a common problem in both ponds and lakes. The ratio between phosphorous and nitrogen will decide what type of algae will be present in ponds. If there is too much phosphorous, certain types of algae will thrive, which is why there must be balance. Beneficial bacteria can play a role in food production, as they can become a source of food for benthos along with zooplankton, which themselves will become sources of food for fish. It is also possible for these bacteria to be cultured. Biochemists have discovered a number of ways in which beneficial bacteria can be cultured. This allows them to be added to water gardens or ponds in a manner that allows for the decomposition of organic material to be accelerated. This ensures that nutrients are removed, in a process that is called biological augmentation of water quality. First, a large dose is placed in the pond for inoculation, to establish the beneficial bacteria. Next, maintenance doses will be added so that the bacteria thrive. As it replicates and grows, it will begin to tie up both nitrogen and phosphorous inside their cells keeping it away from algae. Most of the beneficial bacteria will head to the pond’s bottom where organic matter will be broken down. However, some will stay inside water columns, where they can most effectively process soluble nutrients as well as phytoplankton which is deceased. There are lots of different formulations for beneficial bacteria. Most will be centered on aerobic type bacteria and will target those compounds which degrade slowly.